Notes: You can double chef Heidi Krahling's recipe to have this Moroccan condiment on hand to add a tart, salty, slightly bitter accent to salads, stews, fish, and couscous. Rinse 2 lemons (5 oz. each). Score peels about 1/4 in. deep down length of lemons, spacing slashes about 1 inch apart. In a 2- to 3-quart nonreactive pan, combine 2 1/2 cups water, 3 tablespoons kosher salt, and lemons. Bring to a boil over high heat, then reduce heat, cover, and simmer until lemon peels are tender when pierced, 12 to 15 minutes. With a slotted spoon, transfer lemons to a pint-size widemouthed canning jar; reserve salted water. Add 2 whole cloves, 1 dried bay leaf, 1 cinnamon stick (3 in. ), and 2 teaspoons each coriander seeds and black peppercorns to jar. Press lemons down slightly to release juices. Pour enough of the reserved salted water over them to cover completely; seal with lid. 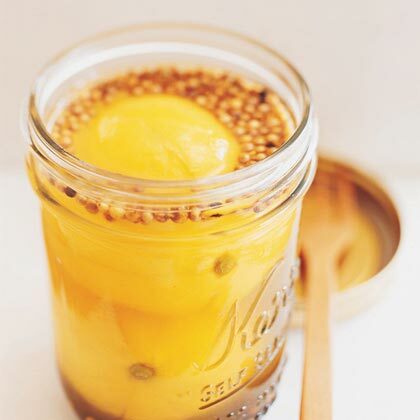 When cool, chill at least 5 days, turning jar occasionally (lemons may darken a little), or up to 3 months. To use, lift lemons from liquid, scrape out soft pulp, and sliver or chop peels.